Stretching from Hart Plaza at the Detroit River northwards to Pontiac, Woodward Avenue is arguably Detroit's most famous thoroughfare. It's the dividing line between the eastside and the westside, and therefore it allows Detroiters to define themselves based upon where they reside in relation to Woodward. 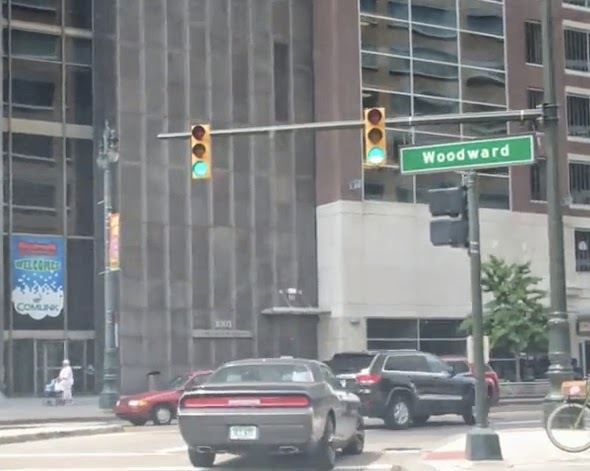 But let's not be divisive, instead let's take a spin up Woodward in downtown Detroit starting at the corner of Jefferson Ave. The video has several edits in it due to the fact that we (Mrs. DVD was at the wheel) kept getting stopped at lights. However, I think it's a pretty good representation of downtown on a Saturday afternoon in late July. Side note, there was a Jimmy Buffet concert at Comerica Park, so you'll see some early concert goers heading down to the park. Despite the nice weather there wasn't that many people downtown compared to other major cities. It seems that Woodward needs a place for people to sit outside, have a few drinks and listen to some live music. On second thought maybe that's what's missing, live music from street musicians or performers at outdoor cafes. Nonetheless, enjoy the drive up Woodward to Martin Luther King Blvd. where the video ends. What's missing from Woodward Ave. in downtown Detroit? Post your comment below!